Harry poses in front of the memory tube from the first computer in California, the Standard Western Automatic Computer, which Harry designed. On Oct. 30 the Baskin School of Engineering and the Office of Research presented emeritus professor, Harry Huskey with the Founding Faculty Award for his role in founding what is now known as the Computer Science Department at UC Santa Cruz. 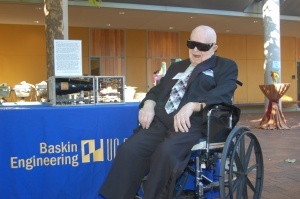 Many of the earliest alumni and faculty attended the event to congratulate Huskey, a true pioneer in the field of computer engineering and computer science.